Since 2009, the number of suspensions at Austin public schools has fallen. But African-American students continue to receive out-of-school suspensions at a higher rate than their peers. During the 2013 school year, 1,066 African-American AISD students – almost 13 percent of the black student population of 8,334 – received out-of-school suspensions. 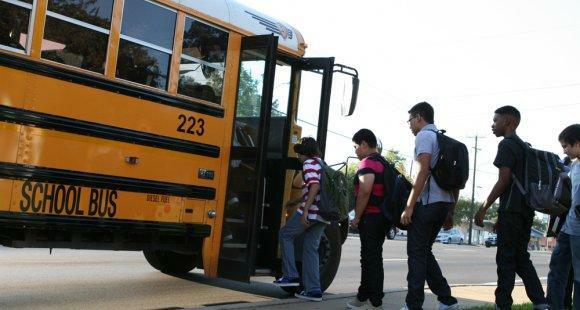 In that same period, 549 white AISD students were suspended­ ­– only 2.24 percent of the 24,543 white student population. Going by those numbers, African-American students are nearly six times more likely to be suspended from school. Despite teacher training and district efforts, many African-American parents and community members feel like their children aren't understood. Pamela Murray's oldest son is finishing up his freshman year at LBJ High School. He's been suspended at least four times; most of those times he's been sent home, instead of receiving in-school suspension. Home suspensions can last up to three days per offense, depending on the severity of the offense and other factors. "First time I think was cause of the hoodie," she says. "I said 'really?' That's a stupid reason – because he had a hoodie." Austin ISD officials say most home suspensions are given when students are physically aggressive towards other students or teachers and for drug possession. Murray says she thinks her son is being targeted for punishment. "Once they focus on a student, they keep that focus on that one student and he's been that one," she says. "Because other students walk around with hoodies on their head and they say nothing." Murray acknowledges not all the suspensions were unwarranted; her son has been in some fights. She says he's skinny and kids have picked on him since middle school. "Now he's gotten to the point where he's going to defend himself," she says. African-American students like Murray's son make up eight percent of the students in the Austin school district. But black students account for nearly a quarter of students given home suspensions. This doesn't surprise Pamela Murray's sister, Latisha Anderson. "The reason that it doesn't surprise me is because I came up through AISD and I was one of those African-American students that was suspended," she says. "Part of it was due to my own, but I didn't really have anyone school-wise that tried to find out why I was doing the things I [was] doing." The suspension issue isn't unique to Austin. In March, the U.S. Department of Education released a report that found black students as early as preschool are more likely to be suspended nationwide. The Obama administration released a set of guidelines earlier this year to help schools reduce the number of African-American and minority students sent to court instead of the principal's office. Under former AISD Superintendent Meria Carstarphen, the district reduced the number of minority and special education students given in-school suspension. But African American students continue to receive home suspension at a higher rate than their peers. Anderson tried to get her nephew a male mentor through the district. The district offers an alternative suspension program at LBJ and Reagan high schools with the Harvest Foundation that provides mentors to students with disciplinary problems, particularly male students. A few months after he was born his father died of bone cancer. Five years ago, his grandfather died. "Nobody makes an attempt to understand that," she says – a sentiment shared by both sisters. AISD did not make LBJ Principal Sheila Henry available for an interview by KUT’s deadline, but Anderson says she likes her approach. "She does make an effort to reach out to the students and I like that about her," she says. "She's friendly and not all stuffy." Anderson’s own son is at Overton Elementary, and she worries discipline will become an issue as he gets older. Her son is autistic, and Anderson's concerned he will be seen as "unteachable." She also worries home suspensions put students at a disadvantage academically. "What is the child going to learn at home, sending him home," she asks. "… Sending a child home if they said something smart or they didn't pull they pants up, that child is missing out on instructional time and when they miss out they get further and further behind." Statistically, a ninth-grader who's suspended is at double the risk of dropping out [PDF]. Suspension also increases their risk of getting caught up in the juvenile justice system – what critics call the "school-to-prison pipeline." Tomorrow, KUT examines why the disparity in home suspensions might exist between African-American students and their peers. Austin has its own convoluted history when it comes to school integration – one involving multiple federal lawsuits and many different strategies to desegregate schools. Busing was one of those strategies. Many students were bused across the city to schools on the other side of town. West Austin residents went to East Austin schools and visa versa. Saturday, May 17, marks 60 years since the Supreme Court struck down the concept of "separate but equal" in Brown v. Board of Education. It's a decision that affected students across the country. But for two Austin teenagers in the late 1980s, it also sparked a life-long friendship. If you think about it, it’s a miracle Richard Reddick and Ryan Scarborough ever met. Scarborough, a white student from Austin’s Northwest Hills neighborhood, was bused to Johnston High School on Austin's east side, starting in 1986. The overall Austin population exploded between 2000 and 2010, growing by more than 20 percent. But a University of Texas study [PDF] finds that Austin was the only U.S. city experiencing double-digit population growth that saw its African-American population not only not keep pace, but actually decline. "Among the ten fastest-growing major cities in the United States, Austin stood out in one crucial respect: it was the only such city that suffered a net loss in its African- American population," says study author Dr. Eric Tang. "Indeed, between 2000 and 2010, Austin was a statistical outlier; it was the only major city in the United States to experience a double-digit rate of general population growth coincident with African-American population decline." The Austin School Board has its first board meeting tonight with Interim Superintendent Paul Cruz tonight. The board faces many decisions in the coming months, and some are worried it’s having trouble making decisions – especially as it begins its search for a new superintendent. Last general board meeting, school board members Cheryl Bradley and Jayme Mathias clashed over the approval of school uniforms for the new single-gender campuses, with Bradley calling Mathias' proposal to postpone a decision "ridiculous."